“…Tis true without lying, certain & most true. “… Ah, maiden Persephoneia! You could not find how to escape your mating! No, a drakon was your mate, when Zeus changed his face and came, rolling in many a loving coil through the dark to the corner of the maiden’s chamber, and shaking his hairy chaps he lulled to sleep as he crept the eyes of those creatures of his own shape who guarded the door. He licked the girl’s form gently with wooing lips. By this marriage with the heavenly drakon, the womb of Persephone swelled with living fruit, and she bore Zagreus the horned baby, who by himself climbed upon the heavenly throne of Zeus and brandished lightning in his little hand, and newly born, lifted and carried thunderbolts in his tender fingers. By the fierce resentment of implacable Hera, the Titanes cunningly smeared their round faces with disguising chalk, and while he contemplated his changeling countenance reflected in a mirror they destroyed him with an infernal knife. There where his limbs had been cut piecemeal by the Titan steel, the end of his life was the beginning of a new life as Dionysos. He appeared in another shape, and changed into many forms: now young like crafty Kronides [Zeus] shaking the aegis-cape, now as ancient Kronos heavy-kneed, pouring rain. Sometimes he was a curiously formed baby, sometimes like a mad youth with the flower of the first down marking his rounded chin with black. Again, a mimic lion he uttered a horrible roar in furious rage from a wild snarling throat, as he lifted a neck shadowed by a thick mane, marking his body on both sides with the self-striking whip of a tail which flickered about over his hairy back. Next, he left the shape of a lion’s looks and let out a ringing neigh, now like an unbroken horse that lifts his neck on high to shake out the imperious tooth of the bit, and rubbing, whitened his cheek with hoary foam. Sometimes he poured out a whistling hiss from his mouth, a curling horned serpent covered with scales, darting out his tongue from his gaping throat, and leaping upon the grim head of some Titan encircled his neck in snaky spiral coils. Then he left the shape of the restless crawler and became a tiger with gay stripes on his body; or again like a bull emitting a counterfeit roar from his mouth he butted the Titanes with sharp horn. So he fought for his life, until Hera with jealous throat bellowed harshly through the air–that heavy-resentful step-mother! 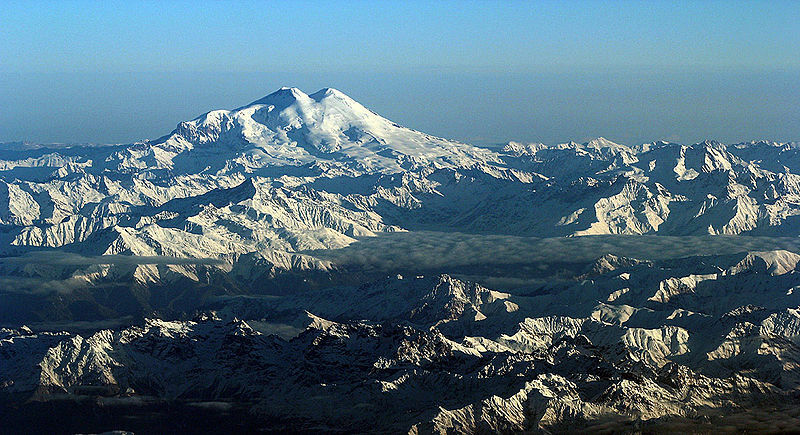 And the gates of Olympos rattled in echo to her jealous throat from high heaven. Then the bold bull collapsed: the murderers each eager for his turn with the knife chopt piecemeal the bull-shaped Dionysos. 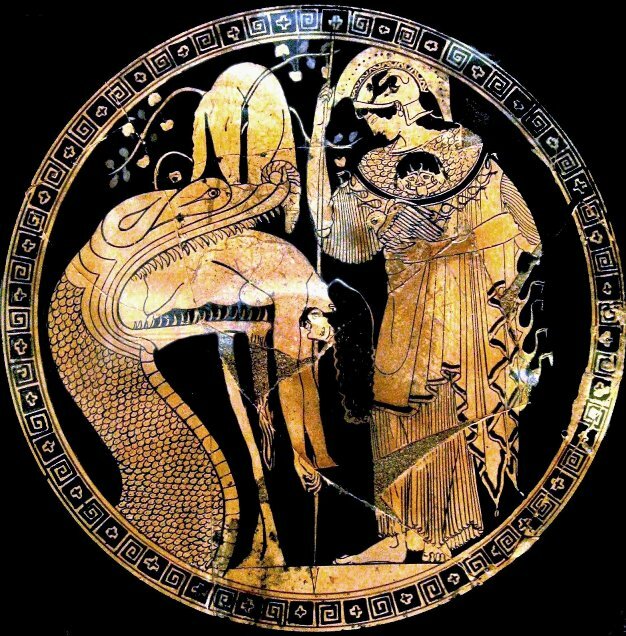 Nonnus appears to imply that Zeus actually used the mirror to cause the burning of Gaia, just as with the preceding sequence of the ‘image’ of Dionysus-Zagreus undergoing transfiguration at the moment of his demise, becoming at once Zeus, Kronos, a baby, a youth, a lion, a wild stallion, a serpent, a tiger and finally a sacrificial bull. It is somewhat akin to the breaking up of the mirror’s image, and the fluidity of this suggests that the mirror might even have been (perhaps unsurprisingly) of a watery or liquid nature in the Dionysian mysteries. The young god’s act of looking into the mirror is a first taste of death, in which its transformative potential is revealed as his image and body break apart and are dispersed. This has been interpreted as a process of undoing of the self experienced by initiates of the Dionysian mysteries. In Nonnus’ telling of the myth, Zeus burns and then floods the world in revenge for this act, setting the scene for renewal under a new refreshed order after the Titanomachy. Dionysus is reassembled and cared for on high mountain tops by the Nymphs. This myth resonates strongly with the Zoroastrian creation myth of the Bundahisihn in which all natural life emerges from the body of an ancient bull killed by beings of chaos. 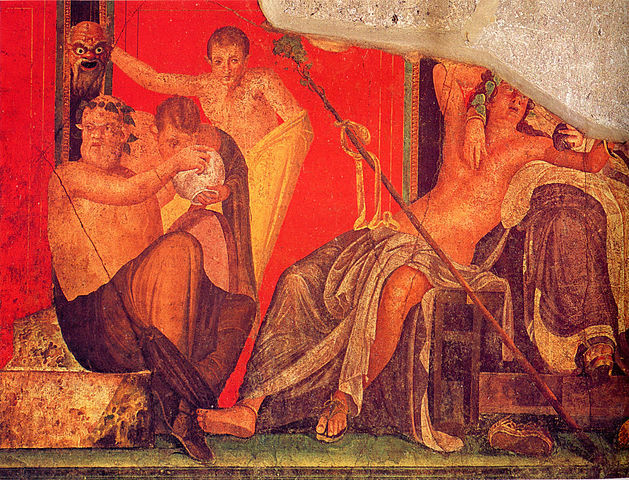 Fresco from the ‘Villa of Mysteries’ at Pompeii, depicting Dionysian initiatory scenes. 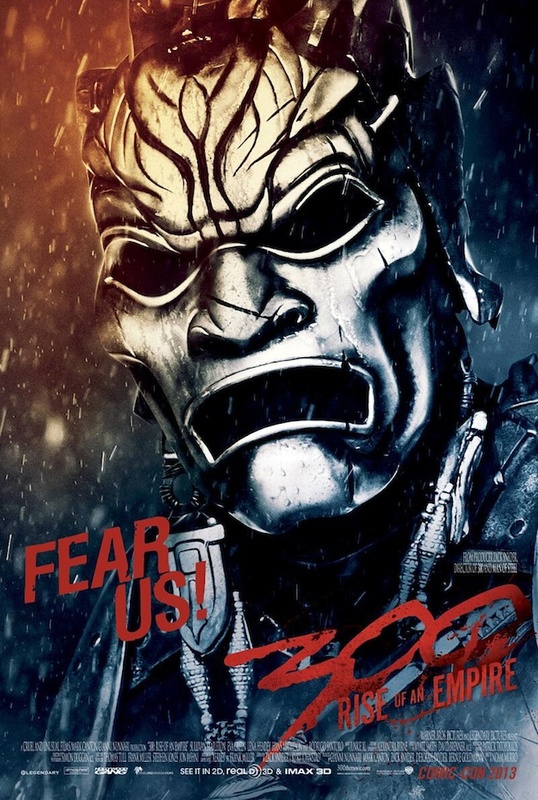 Here the youth appears to peer into a basin of liquid to see the reflection of the mask behind him. The image resonates strongly with the imagery later conjured by Nonnus in ‘Dionysiaca’. Evidently, Nonnus’ account of the use of the mirror is based on an ancient myth as Clement of Alexandria (Exhortation to the Greeks – 2nd CE) commented on the use of the mirror in Orphic-Dionysian mystery cult, and it appears that the ‘Dionysian mirror’ was an important allegorical part of the cult. The appearance of numerous elaborately-decorated mirrors depicting mythological scenes in the graves of Etruscan nobles from the 6th-1stC BCE offers a fascinating yet poorly understood link to the mysterious role of the mirror in relation to the afterlife and its mysteries. Likewise, the shiny ‘Orphic’ gold tablets accompanying the dead in Romano-Greek tombs of the same period may hold a similar significance. 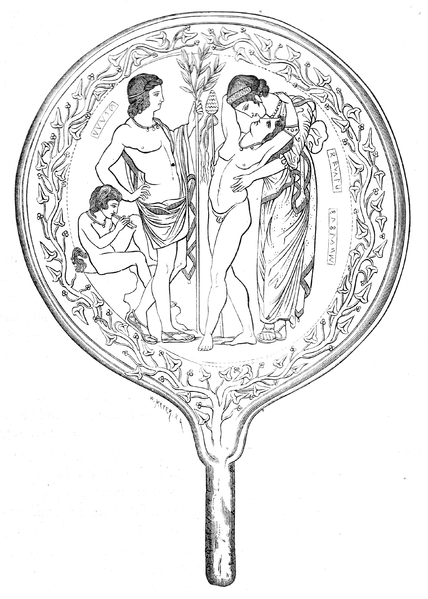 Dionysus (with Thyrsus), Semele and Apollo (with Laurel branch) depicted on an Etruscan funerary mirror. 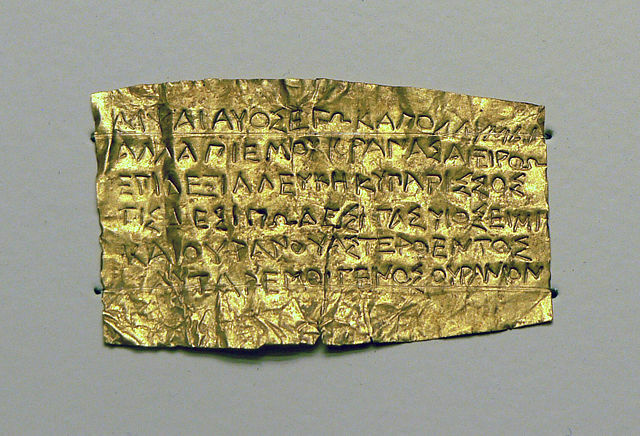 A 4thC BCE ‘Orphic’ gold tablet, typically buried with a dead initiate of the Dionysian mysteries. The reflectivity of the tablet is broken up by the inscription…. 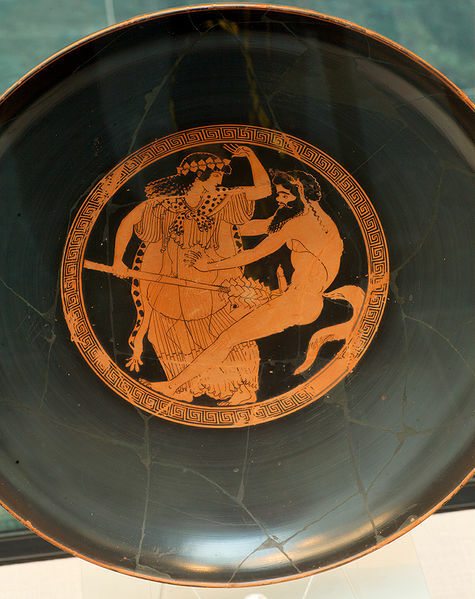 Although the mirror as an object is infrequently depicted in relation to Dionysian imagery in ancient Greek and Greco-Roman imagery, one must remember that almost every such image depicts a dish or vessel containing the ‘blood’ of the god – wine. The reflectivity of this dark liquid cannot be understated, and it would seem quite probable that this was in fact the true ‘mirror’ of the Dionysian mysteries. Mirrors offer an apparently inverted reflection of the light reflecting on them. The most basic mirror for humankind is experienced in the smooth surface of water or liquids, which was mimicked in the polishing of stones and metals to create functional mirrors. From the most ancient times until the present, mirror-surfaces have been used in the mantic/divinatory arts for ‘seeing’ beyond the mundane. The imperfections in the reflection offer re-interpretations of the source image, so divinatory mirrors are often imperfect reflective surfaces: bowls of water, tea leaves in the bottom of a cup, blood from a sacrificial animal etc being good examples. Of course, we come across this mythologically in the subterranean pools, lakes and rivers which the heroes and gods who visit and return from Hades invariably encounter. These liminal waters also occur in the legends of heroes who visit far-off islands and encounter the monstrous, Tartarean creatures sired by the Titans: Medusa, the Graeae, the snake of the Garden of the Hesperides etc. This theme is common to the myths of the Celtic and German worlds of northern Europe and was in evidence at the time the Roman world encroached on these from the 4th BCE onwards…. The pit of chaos or Tartaros, lying beyond the deeps of the earth and sea was the ancient Greek idea of ‘antimatter’, in opposition to the celestial light and order of the heavens. Of the sublunary world, the elements of water and earth partook of a greater part of the nature of this chaos, including the Titans, giants and monstrous beings. Likewise, air and fire partook of the more luminous properties of the higher nature of things in the heavens, including the gods. The ‘interface’ between these two aspects of perceived reality was a very liminal place in which ideas became inverted, and opposites found unity. The ‘underworld’ of Greco-Roman mythology should not be seen as a lower realm from which souls struggle up incrementally in order to return to the light, but as an exact mirror and equally valid version of the ‘celestial’ world. In other words: Zeus is Hades inverted, Poseidon is the synthesis of both. Dionysus was therefore, like Hermes and Apollon, a Daimon who unified these god-themes and manifested them in the mundane world. 279BC and the ‘Sons of Tuireann’. 279BC marked the zenith of the Celtic ‘La Tene’ cultural period and the warlike seemingly pan-Celtic ‘Belgic’ religious-cultural movement which had rocked Europe to its core and provided Europe’s first verifiable highly mobile elite mercenary fighting forces. It was the year that combined Celtic (‘Gaulish’) armies, having began an invasion and settlement of the Balkans some years previously, surged down through Macedonia and northern Greece and sacked of the holy city of Delphi – home to the shrine of Apollo and the Pythean Oracle. It was ancient Greece’s most sacred (and wealthy) religious site and was internationally famous. Rumours of fantastical treasure hordes carried off from these conquests back into the Celtic world persisted for centuries afterwards (e.g. ‘The Gold of Tolosa’), and it is highly likely that the stunning victories became the stuff of legends and stories for an even longer period to come. A more interesting aspect of the episode is that it fundamentally changed opinions in the Greek and Roman worlds about Celtic power: The combination of 279BCE with the earlier 4thC BCE sack of Rome by another warlord called Brennus, and the various Punic Wars in which significant Celtic mercenary forces fought for Carthage, ultimately ensured that Rome’s Julio-Claudian dynasts were determined to smash independent Celtic power and culture in its seats across western and northern Europe. It has always intrigued me how tales of this stellar 3rdC BC event might have filtered back to Britain and (in particular) to Ireland, and influenced the medieval story traditions that have survived down to this day. An example I would like to share with you is a story known as Oidheadh Chlainne Tuireann (‘The Tragedy of the Sons of Tuireann’), which was translated to English under the name ‘The Fate of the Children of Tuireann’ by Eugene O’Curry and first published in ‘The Atlantis’ (Volume IV, 1863) alongside the equally important ‘Fate of the Children of Lir’. The earliest surviving manuscript of the tale is of a late period (16th/17thC) and is written in Early Modern Irish. However, the story has some features of great antiquity to it, and the narrative is in the tradition of the ‘Mythological Cycle’ discussing the war between the Fomorians and the Tuatha De Danann: an imaginative and magical period of prehistory. The tale seeks to illustrate the inevitabilty of how acts against gods will ultimately ensure the demise of the proud and vainglorious, and as such mirrors the typical tragedean approach of ancient Greek myths. First, take a look at the story, here at the Celtic Literature Collective website. O’Curry’s translation can be found here, with extra notes. The story is essentially about a group of three warrior brothers: Brian (the leader), Iuchar and Iucharba . On account of a blood-feud, they kill Cian of the Tuatha De Danann, inviting the wrath of his son – the solar warrior and champion leader of the Tuatha De Danann knights: Lugh Lamhfada (‘Long Arm’). Lugh sets an erec (compensation fee) that at first seems lenient, but it transpires that Lugh has tricked them, and the warriors must engage in a wild and violent chase across Europe and the Middle East in order to gain what turns out to be the magical treasures of foreign kings, treasures that Lugh will require in order to win the final Battle of Magh Tureadh against the Fomorians. Tuireann’s sons achieve their goal, but ultimately meet their demise in so doing, sealing Lugh’s revenge with blood. Upon closer analysis, this story shares many features of that of the famous 3rdC BCE invasion of Greece and sacking of Delphi. This episode, which started out as a Celtic attempt to immitate the glory of Alexander of Macedonia, as well as being motivated by greed and envy of the unstable post-Alexandrian state of the Macedonian monarchy and northern Greek alliances. It culminated in an act of religious desecration, which (in the ancient world) whilst seeming daring would have had a number of ominous consequences. The repercussions against Celtic culture (and in particular druidic culture) which were to come would have been interpreted in the light of the these events, and no doubt affected the morality expressed in poetic arts. Even the legends of Sigurd among the Germanic peoples can be interpreted in this same context. Lugh’s first task, is to have the sons of Tuirenn plunder the apples (of immortality) from the orchard of the Hesperides, which was in ancient times believed to lie at the furthest point to the east in the world-encircling sea (river) of Okeanos. To reach it, Brian and his brothers are forced to borrow Mannanan’s boat ‘Sguabatuinne’ (‘Wave Sweeper’). Once there they take the form of birds in order to steal the apples. It is obviously a retelling from the myth of Hercules, but with a distinct Celtic twist: the theme of distant islands and birds feature heavily in other perhaps older Irish tales and poems dealing with the Otherworld, including the Legend of St Brendan, and ‘The Voyage of Bran’. It is believed that birds were the souls of the dead, or conducted the souls of the dead to the Celtic Otherworld. 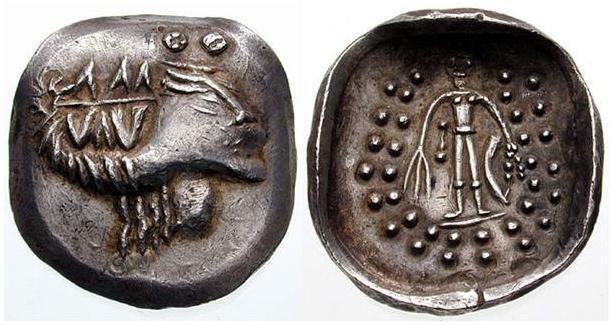 Another Celtic Thasos imitation depicting Apollo – the god of Delphi. with his bow and three arrows. It seems that the very act of going east towards the rising sun to seek the apples of immortality was an ideological theme which would have appealed greatly to the Gaulish warriors of Brennus’ army, seeking glorious immortality through heroic acts. In the 1st centuries BC and CE, Roman authors commented upon the fanatical aspects of Gaulish religion (said to have arisen in Britain) and that warriors were motivated to bravery by a belief in future reincarnation. Hercules’ defeat of the serpent Ladon in the garden of the Hesperides seems to be an alternate version of the Delphic myth of Apollo slaying Python. In our Irish tale, the leader of the adventurers is called ‘Brian’, very similar to the name Bran, and also to Brennus. All three means Raven in Celtic languages – the archetypal bird of war, and perhaps a symbol of reincarnating warriors. After the Hesperides, the next significant target for the sons of Tuireann is the court of the Greek king, ‘Tuis’ (possibly a celticization of ‘Attis’). 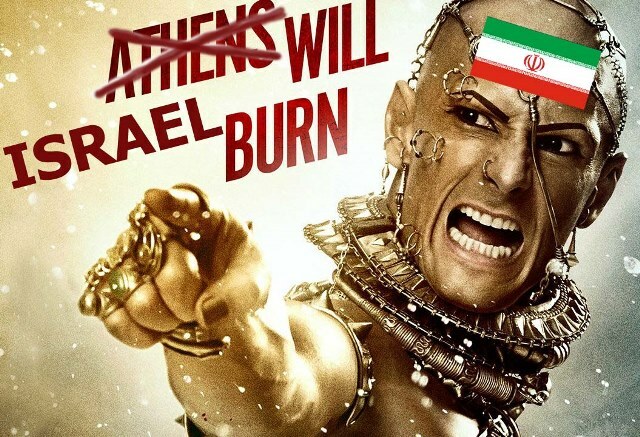 This seems suspiciously close to the raid on Delphi, particularly as they demand the king’s magical healing pig skin which brings men back to life. Tuis refuses but offers instead to give them as much gold as will fit on the skin, to which they acquiesce, only to whip the skin out from under the king’s nose in the treasury, kill the king and make off. The Gaulish army of 279BC famously killed the Macedonian King, Ptolemy Keraunos, before Brennus’ faction made for Delphi. Apollo (the god of Delphi) was famously a god of healing, and a need for healing is a theme which crops up again and again in Oidheadh Chlainne Tuireann. Next, the brothers go to Persia to obtain the king’s magically potent spear, killing the Persian king into the bargain. This may be a reference to the elements of Brennus’ army who settled in Anatolia and became known as Galatians. They were notorious as making their living as a mercenary fighting force among the Seleucid Kingdoms and were deployed across the middle east, perhaps as far as Persia, in fighting their wars. Another interpretation could be of the spear representing the Gaulish defeat of the Macedonian kingdom, which had in turn defeated the Achaemenid Empire (represented in the Irish tale by the ‘King of Persia’). After Persia, they go to the King of Sicily (Siguil) posing as mercenaries in order to relieve him of his chariot and team of horses. This seems to be a reference to the Pyrrhic war, which coincided with and continued after the sack of Delphi. It involved the Carthaginians and Greeks fighting over Sicily, and although we cannot be certain that Celtic mercenaries were involved in this conflict, we know that they played a major role in the Second Punic War. Another Delphi-related detail is that one of its treasures was reported to be a large golden image of a god (probably Helios) riding a chariot. From there, the heroes go to the kingdom of’ ‘Coloman Orda’, which O’Curry translates as ‘Pillars of Gold’. The location of this is less certain, but the Lugh demands the heroes relieve the king of this place of his nine magical regenerating pigs. I would suggest that the kingdom of the Pillars of Gold, well stocked with endless pigs suggests the Iberian peninsula. Iberian and Southern Gaulish support for Carthage was a significant factor in Hannibal’s campaign during the Second Punic War, the Celts of the city of Gades (modern Cadiz) having been ancient trading partners and cultural exchangees of the Phoenicians. The pigs are recognisably similar to the magic pigs owned by Manannan Mac Lir. The story resonates with themes from the late Celtic iron age, tracing the descent of this golden age from the glory and immortality of the attacks on Delphi, the apparent ill-luck and kin-strife of its aftermath leading through the ill-advised mercenary alliances of the Punic Wars and finally to the destruction of independent Celtic power by the conquests of Spain, Gaul, and Britain by the Romans. These events marked the final retreat of independent Celtic power in to the far northern and northwestern climes of Europe. The story of Brennus and that of the Sons of Tuirenn are (like that of Alexander the Great) a warning against vainglory, and the corruption of men by power and money. They are an evocation of the ancient pagan European concept that no manner of power and glory will make you immune from the implacable wrath of the gods when ill-treated. The manuscripts of this story date at their earliest to the 16th/17thC, a period when Ireland had been subjected to invasion and settlement by the protestant Tudor and Stuart monarchies of England and Scotland, who were determined to destroy independent Gaelic power and culture, which remained conservatively Roman Catholic in its outlook. In their bids to withstand the invasion, Irish Earls were send out emmisaries across Europe in order to muster support for what would ultimately – like in the story – prove to be a doomed cause. The result was what is known as the ‘Flight of The Earls’. Although probably based on much older traditions, the themes certainly had a contemporary resonance when they were written down in the form we have them today. Irish literature and storytelling has always retained a mythical ability to address contemporary issues, a feature which is as much a testament to the subtlety of its timeless themes as to the frequent need of Irish people to express their ideas in a form disguised from the depredations of censorship and misunderstanding by church or state. The excellent Balkan Celts blog by Brendan MacGonagle is well worth following if you have any interest whatsoever in Celtic Studies and late Iron Age archaeology, in particular that of the Balkans, Greece and Anatolia between the 4thC BC and 3rd CE.